Raspberry, White Chocolate and Blueberry Tart! The patriotic colors and summery flavors combine to make this the perfect 4th of July dessert. 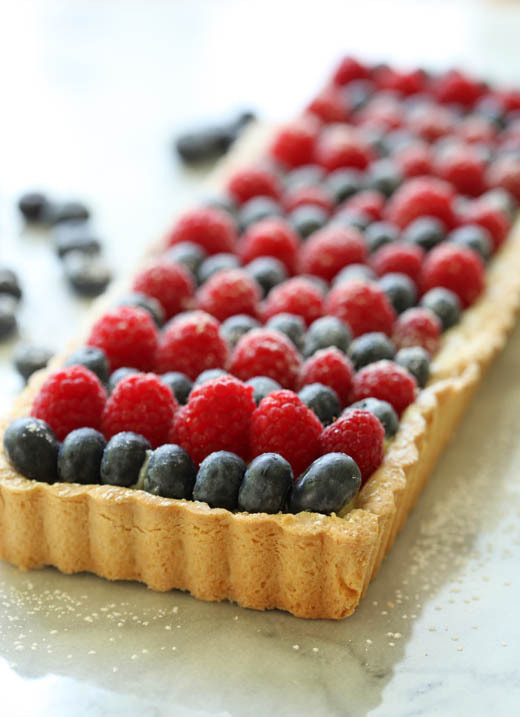 Red raspberries, white chocolate pastry cream and blueberries top an almond shortbread crust. Add a dusting of confectioners’ sugar and you have an easy, yet elegant pastry. Given the holiday I made the tart in a rectangular pan to mimic the shape of the flag, but it also works well in a more traditional round pan or even as individual tartlettes. Later in the summer try this same dessert, but switch the berries for fresh peaches or plums. In a food processor combine the almond meal, flour, confectioners’ sugar and salt. Pulse several times to combine. Add the butter and egg yolk, process just until the dough comes together. 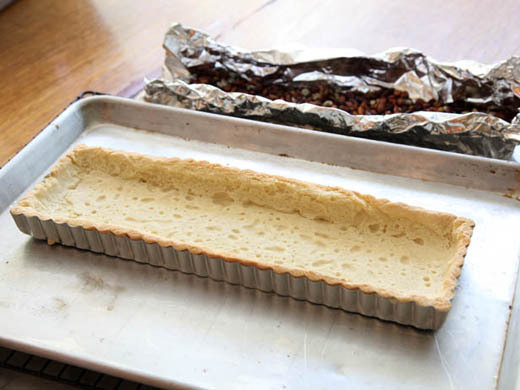 Distribute the dough into the 13×4” Rectangular Tart Pan w/ Removable Bottom (or Round Pan w/ Removable Bottom ). Lay plastic wrap over the dough and press it into the pan so that it is an even thickness. Remove the plastic and freeze the dough until it is firm, about 20 minutes. Cover the dough with foil and fill with pie weights or beans. This will keep the dough from slouching in the pan. 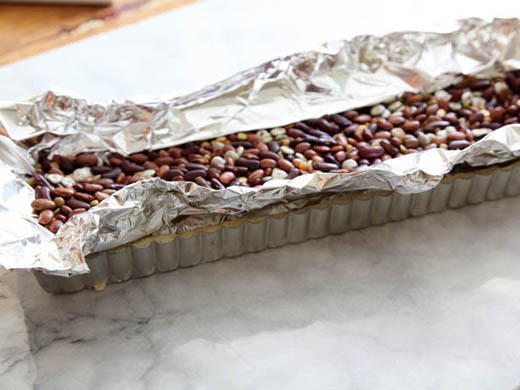 Bake for 25 minutes, then remove the foil and beans, bake for an additional 5-10 minutes or until the crust is a light golden color. Allow to cool to room temperature. Whisk together the cornstarch and 1/4 cup of sugar. Add the egg yolks to the cornstarch and mix into a smooth paste. Set aside. Bring the milk, remaining 1/4 cup of the sugar, vanilla bean, and salt to a gentle simmer in a medium saucepan. Slowly, and in small amounts, whisk the hot milk into the egg mixture. Once the egg mixture is warm to the touch, pour it back into the milk in the pan. Bring the custard to a gentle boil, whisking continuously for 2 to 3 minutes. The pastry cream will thicken almost immediately, but it is important to cook the starch until it isn’t grainy. When the pastry cream is done it will be smooth and glossy. Remove from the heat and add the butter and white chocolate to the pastry cream. Allow to sit for 3 minutes, then gently whisk them together. Pour the pastry cream into a shallow container. Cover with plastic wrap, pressed directly on the surface of the cream to prevent a skin from forming. Set the container in the freezer for 15 minutes (this cools down the eggs quickly) and then refrigerate for up to a few days. 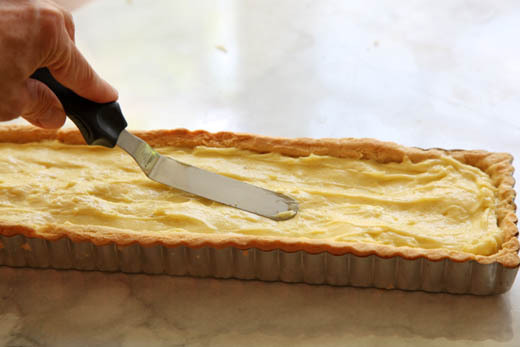 Fill the cooled tart shell with the pastry cream. Sprinkle the top with confectioners’ sugar. Happy 4th of July, enjoy your weekend! Where do you get Almond Meal? I have added a link and info about the almond meal. Thank you for the question, I bet lots of people wondered the same thing! So very pretty! Simple and doesn’t scream 4th of July. Thank you for the tips on putting the wrap to press the pastry (don’t know why I didn’t think of that) and baking it with the beans first so it doesn’t slouch. We don’t want slouchy pastry! Beautiful. 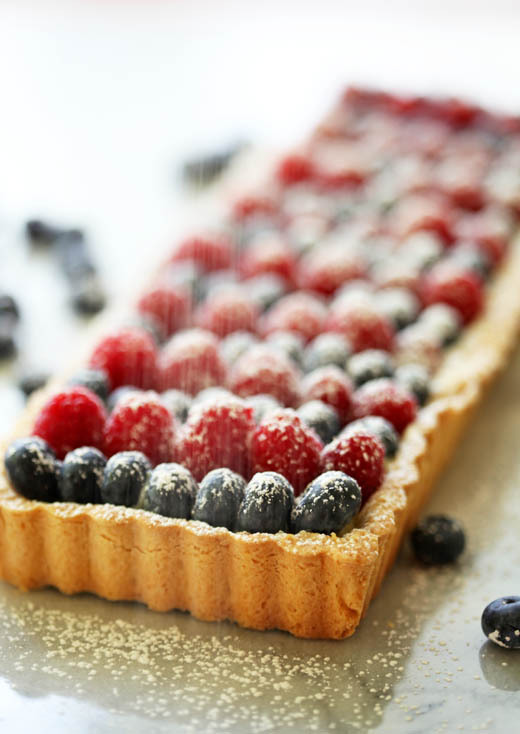 This tart looks so beautiful and festive. 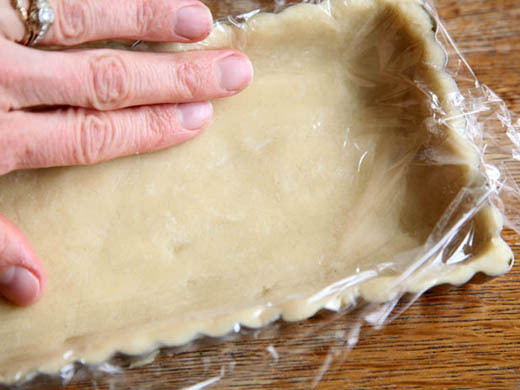 I love the idea of using plastic wrap to press the dough firmly into the tart pan. Now I just need a 4th of July party to take this too! Anyway, this tart looks fabulous. I wonder if one could use flour in place of the almond meal. Thanks! sweet! the simplicity is the magic. Wow, your tart looks perfect. It will make a great dessert for this weekend. Beautiful photos too! It look fantastic and so simple, congratulations for another wonderful recipe!!!! Made this yesterday but have yet to taste it since I’m taking to a dinner tonight. Loved using the plastic wrap to form the crust…great idea! Did not see when to remove the vanilla bean so I guessed it came out before refrigerating the custard. Would love to be able to print the recipe without all the pictures…they’re pretty, but use up a lot of ink. Can’t wait to try it tonight. Thank you for trying the tart, hope you enjoy it and your holiday! yes, you discard the vanilla bean once you refrigerate the custard or before you put it in the tart shell. You can copy the post to microsoft word and delete the pictures there before printing. I love anything with berries in it. Add custard and that is heaven. What a fabulous looking tart. Great photos also. Thanks. Fabulous! I use a very similar pastry dough and have started adding ground nuts in as well. Love it. 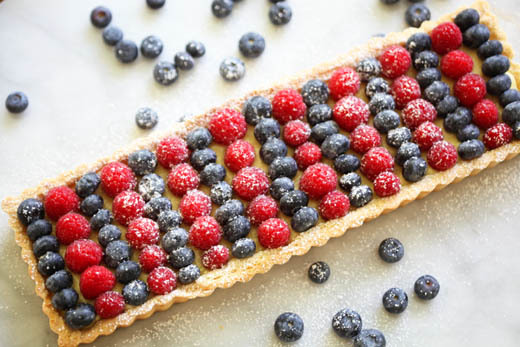 Oooh a pastry cream and berry tart is just the best thing for summer – 4th of July or not! May I ask a question? Does your tart pan have the removable bottom for unmolding? I have some vintage tartlet pans I have been longing to try, but they are one piece and I’m nervous about unmolding the tart. I would guess that one removes the crust from the mold prior to adding the filling, right? Yes, this one has a removable bottom. If you use the pans that do not, you will want to unmold them before filling with the pastry cream and berries. What kind of crust is this? Is this more like a bicuit/bread-kind of crust (which is soft and sponge) or is this more a shortbread/crispy crust? And do I also need to glaze the fruit (by using applejuice/gelatin glaze/ abricot jam glaze? this looks beautiful! I love anything with white chocolate!